To make the marinade, place the ginger, garlic and spring onions into a blender along with the Ssamjang, miso, soy, fish sauce and sesame oil. Blend to a smooth puree. Score the flesh of the beef all the way down to the bone, laterally across the rib. Leave 1-2cm between each incision. Generously rub the marinade onto the beef, ensuring all the incision are filled. Cover and place in the fridge to marinate for at least 24 hours. For the salad, finely slice the cucumber into thin strips. Wash, then roll and finely slice the larger leaves of the parsley and mint and add to the cucumber, leaving the smaller leaves whole. In a small bowl, dissolve the sugar in the yuzu and white soy and season with fish sauce and sesame oil. Mix well to combine use to dress the cucumber salad. To finish, preheat the charcoal BBQ and place the rib flesh-side up (so the bone is in contact with the grill). Grill on low for several minutes, then increase the heat and flip the rib over and brush with marinade. 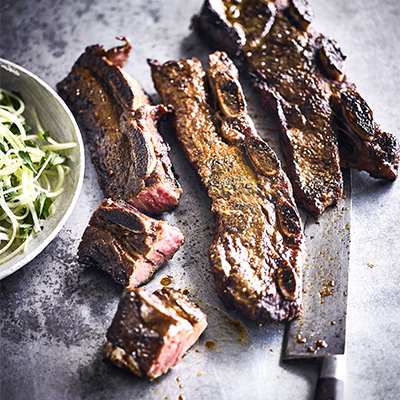 Continue to turn the rib and brush with marinade, cooking until an internal temperature of 56°C is reached when using a probe thermometer. Remove from the grill and allow to rest. Remove the meat from the bones, slicing lengthwise, being wary of the connective tissue between the meat and bone, then slice into 1-2cm sized pieces.